My tiny house, with everything in its place, looks to be far more room than necessary. There are numerous drawers and shelves with nothing in them or on them. Sometimes I even move things that could all fit on one shelf to another, just so that it doesn’t look so empty. The opposite of that is happening right now, however. 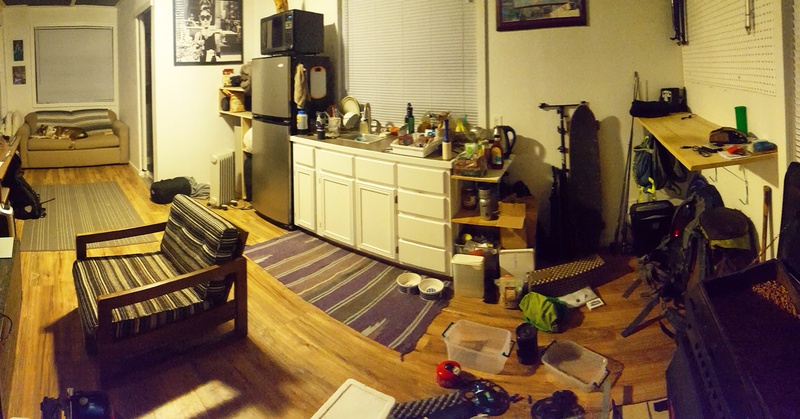 Most of my stuff is out of the drawers and cubbies, strewn all over the floor and flat spaces of my home. For anyone that knows me and my need for order, this is not a relaxing place for me right now. My need for organization has me torn between completing this pack/purge process for vanlife and doing my actual job. And so it sits, disorganized and chaotic, while I tap away on my laptop trying to knock items off my other tasks list. Soon, like two or three weeks soon, this will all be a distant memory and River, my Van, and I will be enjoying the sweet joy of an organized space and a life back on the road.